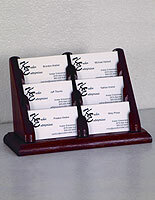 6-pocket, tiered design displays the front of each contact card. Small size won't overwhelm a desk top area. Light Oak wood works in both office & retail environments. Office card holders are versatile marketing tools you can use to help distribute contact cards to new and potential clients. 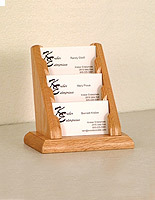 These business card holders, office card holders are made from solid Oak and feature a light finish for a casual yet striking presentation. Not only will these office card holders last through long-term use, but they will also keep your calling cards organized, on display and protected. 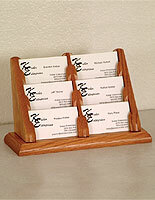 We offer these office card holders with a tiered design to better showcase the front of each contact card. 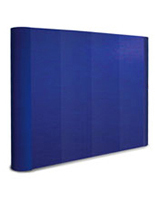 The office card holders, also known as desk accessories and presentational supplies, will therefore prevent clients from potentially damaging cards as they will only select the ones they need. 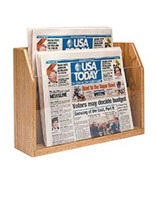 These office card holders are equipped with (6) individual pockets, each holding approximately 30 cards or a 1/2" stack. 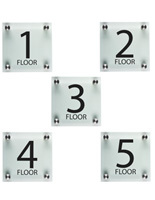 Your office card displays can therefore each hold up to 180 contact cards in (1) 9-1/2"w fixture! 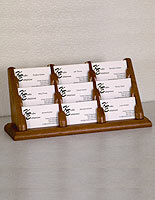 The business card holders, office card holders are ideally meant for use within an office environment, such as a doctor's office, law firm or real estate agency. These office card holders, because of their light wood finish, would also work well in retail environments to display gift cards! 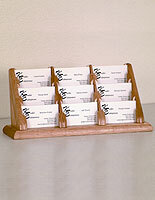 Buy office card holders to keep your contact cards organized and to position them in the front a desk top presentation, ultimately increasing the amount of cards distributed to clients. 32.0" x 5.8" x 4.4"